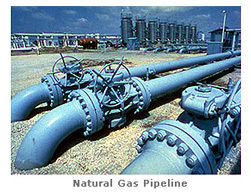 Natural gas occurs in nature and typically comes from deep wells, typically in areas where oil is also present. It is a mixture of several colorless, odorless, lighter-than-air gases that easily burn to produce heat. These gases include methane, ethane, propane, and butane. The amount of heat a cubic foot (cf) of natural gas produces when burned depends on the mixture of these various gases. This mixture can be different depending on the well location. The national standard measure is 1,000 Btu per cf however, the heat content in any given area can vary from this standard by as much as 2%. The term that is used to measure the ability of Natural Gas to produce heat is called the "British Thermal Unit" (Btu): the amount of heat that is necessary to raise the temperature of one pound of water 1° Fahrenheit. As a pint of water weighs approximately 1 pound, one Btu will raise the temperature of a pint of water by 1°F. As this odorless natural gas easily burns, a leak can be hazardous. As a safety feature an odorizer called “Mercaptan” is added when gas is received from pipeline suppliers. The mercaptan added to the gas gives any leak a strong Sulfur odor similar to rotten eggs. The addition of this odorizer is the most important safety feature, because it alerts people to the presence of escaping gas before enough can gather to pose any hazard. A homeowner typically buys natural gas by paying a price measured in $ per ccf (100's of cf). This is the most common pricing unit for metered-residential and small commercial gas usage. Another common unit of heat for pricing is $ per Therm or Decatherm. A Therm is 100,000 Btu and a Decatherm is 1,000,000 Btu (one million Btu). Natural gas is not available in all areas of the country, but where it is available gas is often used as the home heating fuel. Its main advantages are that it is clean burning, and no storage tank is needed. The same as electricity, another advantage is that you pay for it after you use it, not ahead of time as you do with oil or used to do with coal.